I was tempted to have exactly this for breakfast. I resisted. One thing I held off on making before I got my ice cream maker was ice creams made with alternative milks. The closest I came was frozen yogurt, but that doesn’t really count, being all made of dairy and such (though noticeably safer for a little lactose intolerant creature like myself, what with all those friendly cultures in there). 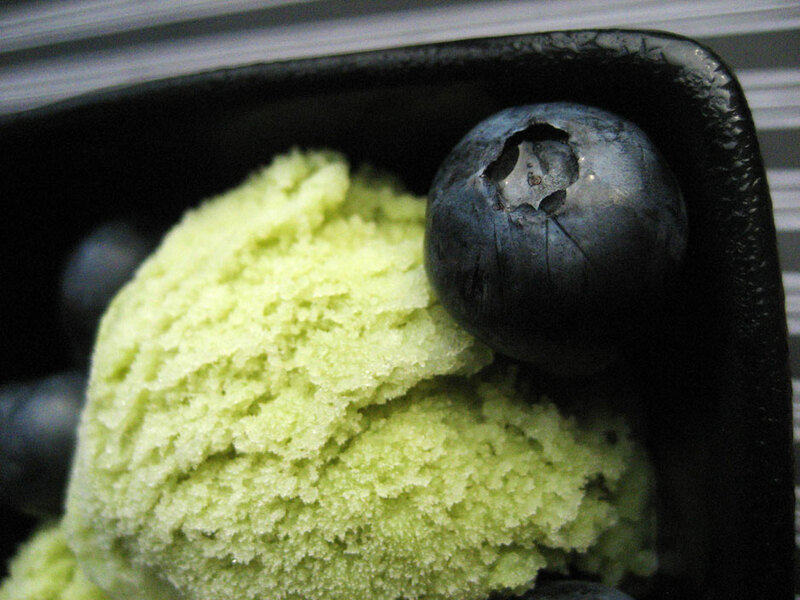 You don't have to have it with blueberries, or any berry at all for that matter. I was a little concerned about ending up with The Dreaded Giant Crystals that form all too easily if you’re not using a machine to churn, so I kept it strictly dairy. But now that I have an ice cream maker, I can pour whatever sugary, milky-or-not concoction I want in there! Yup, this stuff is great just plain, spooned out of the container you froze it in. This particular concoction was actually inspired by a drink I adored one summer back when I was working in the mall. There was a Gloria Jean’s close by the store I worked in and I was a total overpriced-slushy-coffee-thing addict at the time. They had (and still have, I imagine) constant rotating seasonal flavors, and at one point had green tea in their summer menu. I was probably the only real customer they had for that flavor, considering the trashiness of the mall at the time (it’s surprisingly upscale now, with a Coach store, Apple store, Banana Republic, upcoming Teavana outlet, H&M, Lindt chocolate shop, numerous jewelry stores, etc.) but I was completely addicted to giant green tea slushes, made with soy milk, of course. I think those two flavors work really well together, playing off each other’s natural sweetness and plant-y flavors. Of course, if you DO happen to have blueberries, I probably don't need to tell you how well they work with almost any tea. I’m glad I waited until I had the machine to make this. You certainly could try by hand but since it lacks the creamy fattiness of real ice cream, it has more of a packed snow/sorbet texture in the mouth and I imagine it could easily get too icy if not stirred properly. It tastes great – just like the slushes that fueled me through 8+ hours of Spencer Gifts madness all summer long, but frozen until scoopable. 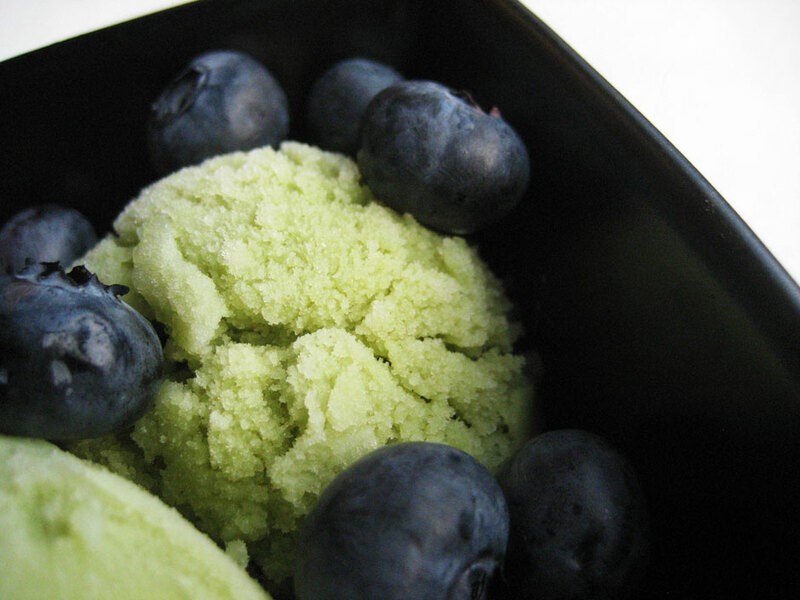 Healthier than a custard- or even Philly-style ice cream, and even moreso when topped with fresh blueberries, or whatever other seasonal fruit you happen to have lying around. Raspberries would be another wonderful addition, or perhaps something citrusy. Well, breakfast was a couple hours ago...might be time to give in to temptation. It's practically a health food...right? In a medium bowl, whisk together the soy milk and sugar until the milk slightly froths. 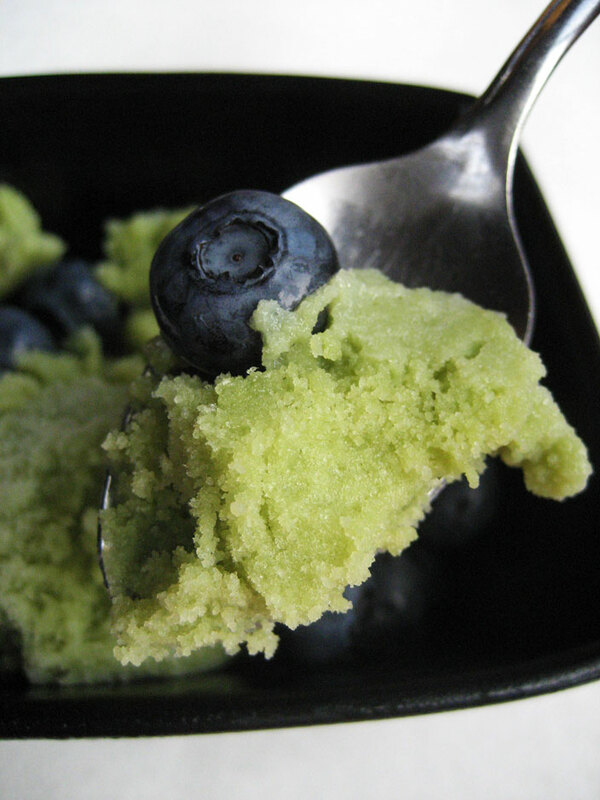 Gradually whisk in the matcha until green and matcha-flavored to your liking, making sure to beat out any little lumpies of green hidden in the mixture. Whisk in the vodka. Freeze with an ice cream maker of your choice or follow my instructions for ice cream without a machine. Serve with fresh fruit, if available. A few things to note: both my soy milk and matcha were of the sweetened variety, so if you are using unsweetened versions of either or both item in this recipe you may have to up the sugar. Just add it a tsp or so at a time until it’s as sweet as you want it, and remember that freezing mutes sweetness a bit so if you over-sweeten a little it’s not the end of the world, though this isn’t meant to be terribly sweet anyway. Really beautiful.Its really a lighter healthier ice cream ansd looks very rich. This looks so lovely and light. I’ve never wanted an ice cream machine but your post has me rethinking that one! And thank you so much for participating in the Ice Cream Social! We realize it’s so cryptic of us not to mention the prizes yet but we wanted to get all our ducks in a row before we revealed them! I think you’re right in waiting to use an ice cream maker. I’ve found whenever I’ve used milk only it has been quite icy with the freeze only method but the churning really helps with milk based ice creams. Nice job! thank you for sharing such a luscious sounding recipe! I can hardly wait to run out and buy an ice cream maker….tomorrow! I am wondering though, can I omit or substitute the vodka with something that is alcohol free? THank you. 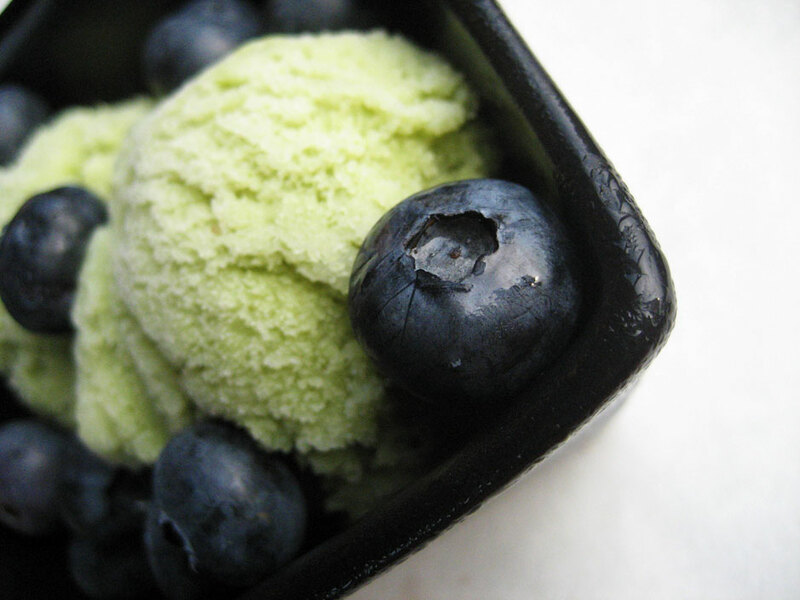 The color of that ice cream is so beautiful, and I just started getting into tea flavorings in my goodies, so I’ll be sure to try this one soon! This looks like a great recipe. I will try it! 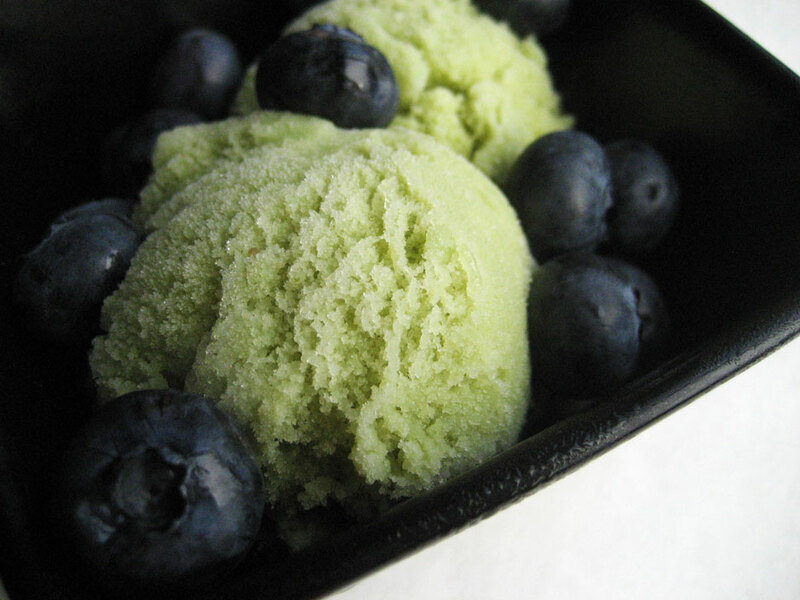 I made a very creamy green tea ice cream with a custard base this weekend using a beautiful deep green matcha…recipe and tea found on matchasource.com. I would suggest using a tablespoon less than it calls for though. YUMMY! I’ve pulled my ice cream maker out of the closet and blew off the dust! I really want to try this recipe. I’ve been searching for recipes made with soy milk and I love green tea. However, I’ve never used Matcha…where do you buy it?